TV White Space Communications and Networks summarizes the current state-of-the-art in this important aspect of wireless communication. Part One covers related technologies, while Part Two looks at policy, regulation and standardization issues. 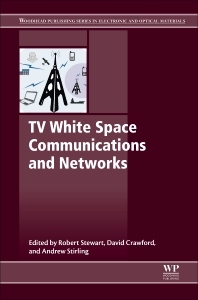 Part Three discusses the commercialization and potential applications of white space networks, rounding out a comprehensive book that provides a standard reference for those researching and commercializing white space networks. Professor Robert Stewart is the MathWorks Professor of Signal Processing at the University of Strathclyde. Since August 2014 he has been the Chair and Head of the Department of Electronic and Electrical Engineering. His research over the last 20 years has focused on signal processing and communications. Dr. David Crawford is the Manager of the Centre for White Space Communications at the University of Strathclyde and a key member of the team involved in the Isle of Bute White Space trial which represents an important demonstration and test of this important technology. Mr. Andrew Stirling is a spectrum and digital platform visionary at Larkhill Consultancy Ltd., who ran the Cambridge White Spce Trials in 2012--one of the largest commercial tests of white space Wi-Fi to date.